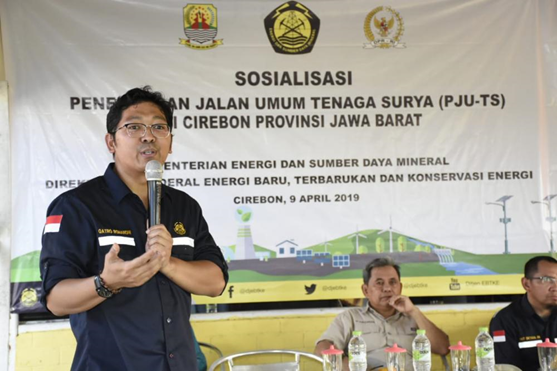 CIREBON - Directorate General of New Energy, Renewable and Energy Conservation (EBTKE) asks the public to be able to submit the proposed installation point for Public Street Lighting- Solar Power (PJU-TS) precisely in the area planned to be built PJU-TS so its utilization is on target. "The Ministry of Energy and Mineral Resources through the Directorate General of EBTKE will re-establish the PJU-TS in 2019 as an effort to provide energy to the community that contributes to reducing Greenhouse Gas (GHG) emissions. Therefore, we ask the community to propose which PJU-TS is suitable. "said the Head of the Plan and Report Section, Qatro Romandhi when socializing the PJU-TS to the people of Cirebon on Tuesday (9/4). Qatro explained that the installation of PJU-TS is a program from the Ministry of Energy and Mineral Resources as a solution to be used on roads in areas that have not been reached by PLN electricity or in areas that have been PLN-owned, but want to reduce electricity consumption in their regions. This program is implemented as mandated by the Energy Law; Government Regulation on Energy Conservation and National Energy Policy; Presidential Regulation concerning the National Action Plan for Reducing Greenhouse Gas Emissions; and ESDM Minister's Regulation on the Implementation of Physical Activities for the Utilization of New Energy and Renewable Energy and Energy Conservation. In 2018, the TS PJU Installation program was carried out by the Ministry of Energy and Mineral Resources which was spread throughout Indonesia precisely in 25 Provinces, with 21,839 units installed. For 2019, the Ministry of Energy and Mineral Resources will re-build approximately 20,980 units of Solar PJU to be installed throughout Indonesia. In general, PJU lights operate independently and do not need a network cable between poles, so that installation becomes easier, practical, economical, and can avoid total black out in the event of a disturbance. The technical components include solar modules, batteries, solar charge controllers, poles and brackets, LED lights and armature, cables and accessories, as well as installations and foundations. For the principle of work, solar panels capture the energy contained in light / sunlight, then convert it into electrical energy which then stores the energy in the battery. The electricity produced by solar panels is stored in a battery which will then be used as energy to light the PJU lights. "Now pay the electricity bill for public street lighting every month, on average, for example 1 million / month for 4 points, imagine for one village you spend 12 million per month for one village multiplied by 420 villages. If the PJU is electricity must continue to fill in areas where there is no PJU, so the burden will increase further, "said Qatro. Therefore, according to Qatro, since now the community has begun to identify which areas have not received the PJU-TS that will not enter the network electricity, so that can be proposed allocation points in 2019. "With the PJU-TS, we avoid the use of electricity, where we can carry out activities whose names reduce greenhouse gas emissions, are more environmentally friendly. This technology is a very efficient technology and no longer needs to think about when it dies, these lights can "It automatically turns on when needed, the system reduces its capacity so the battery can last longer," explained Qatro.